Telafonica is a group of musicians, visual artists, graphic designers and delay pedals. In all media, Telafonica focuses on fusing cutting edge technologies with hand made, traditional techniques and aesthetics. A 5/4 stumble through a swirling world of noise and ambience. Melancholy rears its head for a brief song in the midst of joyful sound washes. Telafonica is a group of musicians, visual artists, graphic designers and delay pedals. In all media, Telafonica uses a fusion of cutting edge technologies and handmade, traditional techniques and aesthetics. Beats, electronics and guitar noise hide the fact that, at its heart, The Shape Of What's Gone is a simple c&w lament for what once was but is no longer. From the brand new album - Tales Of Loss In The Stereo Field. Telafonica is a group of musicians, visual artists, graphic designers and delay pedals. In all media, Telafonica focuses on a fusion of cutting edge technologies and handmade techniques and aesthetics. What Remains is a treatise to long held love which both strengthens and shifts inexorably as a mind slowly slides into dementia. Two separate mixes are spread hard left and right, resulting in a swirling miasma of psychedelic melancholia. Australian electronic music legend, Andy Rantzen (Itch-E & Scratch-E, The Blue Hour, Pelican Daughters, Cherry2000, FC Europa). Does anything more need be said? Strip everything back to a couple of amateur ukulele riffs, some electronic rhythm pulses and words of sage advice. Darkness and light. Lessons In Time gathers handfuls of sounds and throws them into the air. They are then kept spinning precariously as fragments of song are formed in their shadow. Comatose nylon string guitar under world-weary vocals, building to a troubled, cut-up noise climax. Fire to the Stars is a loose confederation of warring tribes based in Melbourne. They mix glorious pop with cacophonous noise, bliss with melancholy, history with the now. The melancholy exorcism of waves and crescendos of sound/voice/word. A group of musicians, visual artists, graphic designers and delay pedals. In all media, Telafonica focuses on a fusion of cutting edge technologies and handmade, traditional techniques and aesthetics. Founding member of Infusion, Ben Askins, follows his own path of technological, musical exploration. 'In Transit' bumps up the groove and kicks in the acid squiggles. 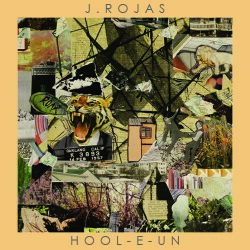 Inspired by Kanye West, James Blake, Flying Lotus and Schlomo, 20 year old J.Rojas makes slinky future-pop for anyone who will listen. Cut up, glitched, disembodied voices fly around a swathe of pulsing, compressed, synth washes and loping blob grooves. The godfather of Australian electronica, Andy Rantzen (Itch-e & Scratch-e, Pelican Daughters, Cherry2000, The Blue Hour) returns with his first solo album release in a decade, a minimal electro mindwarp. Classic drum machine and digital edged electro deployed in minimal strokes under pitch shifted, whispered vocals. Shiny synths battle with subsonic bottom end over a half-time scrawl with clicketty spikes of rhythm. All this is under-girded by Karoshi's usual attention to melodic detail. Blissed out and hazy, Karoshi chops up minute voice particles to lay over a deep groove built with electronics and live drums. Handfuls of sounds are gathered and thrown into the air. They are then kept spinning precariously as fragments of song are formed in their shadow. Built around a loping drum loop which is chopped and spluttered, Lessons In Time then places his sing song vocals over the top for a brief, cleansing blast of noise pop. Australian music legend, Dave McCormack (Custard, The Titanics, The Poalroids), picks out the quirks of the original track, ramps up the joyful, playful bits and presents a blissed out, summer groove. An exploration of late capitalist self serving thought over an ecstatic blast of noise and beats. Yes, it is ironic, but you're going to want to sing along. Joe Hardy takes Telafonica's shuffling original and gives it an epic, melancholy interpretation with booming bass, atmospheric synth swirls and a climactic denouement. Actual Russian Brides push Telafonica's original through the all electro blender. Girl voices float over blippy synths and scattershot drum machine. Option Command compresses 'Viceory', the 15 minute opening track from Telafonica's forthcoming 'Sleeping With The Fishermen' album into three and a half minutes of dark, electronic psychedelic pop. Opening track from the new Lessons In Time EP, opening up vistas of longing as the stuttered rhythms prance forward.